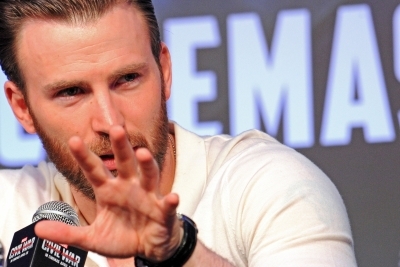 Singapore April 15 (IANS) Actor Chris Evans has been vocal about the end of his character Captain America on the big screen. So is there scope for a woman to pick up his shield and be the star-spangled hero? "I think you can expect other female characters. There are thousands of superheroes and they are from all walks of life different genders and racial diversity. "So moving forward... you can see the mantle getting handed over to different characters other than revisiting characters that we have already seen " Joe Russo who directed Marvel Studios "Captain America: The Winter Soldier" and "Captain America: Civil War" with his brother Anthony Russo said in response to a question by IANS here. Trinh Tran executive producer of the Russo brothers next directorial "Avengers: Infinity War" said they are working on "Captain Marvel" which will be the first female-led movie from the studio. "As we go chapter to chapter more faces will come along there will be more characters to explore and more franchises to be created " Tran said during an interaction for the promotion of the forthcoming film "Avengers: Infinity War". Diversity will continue to be significant for Marvel Studios which is behind one of the most successful films - "Black Panther" a film that had a nearly all-black cast. "I think in the next phase of Marvel you are going to see a much more diverse phase. There s a global audience that loves these movies " said Joe. And as filmmakers they think they should make films that "reflect" the global audience. Joe feels it is important to make big superhero films. "I think these characters represent something to everyone who watches the films. You see a certain part of yourself in these films and root for the characters that you identify with " he said. Sharing an example he said: "Bucky Barnes is an emo (emotional) character. People who relate to him are passionate. He is very vulnerable. People want to see him succeed and be healed. "The stories are really important to the society that help us convey ideas at a subliminal level." But such films despite being blockbusters fail to bag Oscars. "I think the Oscars do a very specific (job) which is to bring focus to movies that didn t get the attention that they deserved. "Superhero films are not necessarily the kind of films that require more attention " Joe said in response to a question by IANS. He is also not sure if the "older" lot watches such movies. "This is driven by the core audience that is younger. It s (to win an Oscar) not why we make films. We make the films to reach out to a wide audience and fans who are very supportive of them. But maybe someday " added the massive comic book fan.